The snow-covered mountains of Khirsu offer a panoramic view of the Central Himalayas and attract a large number of tourists. From here one can get a clear view of many named & unnamed peaks. Located 19 kms. 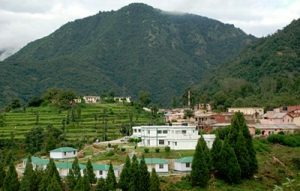 Away from Pauri at an altitude of 1,700 mts., khirsu is a peaceful spot, free from pollution. Only the chirping of birds breaks the tranquility of the adjoining thick Oak and Deodar forests and apple orchards. 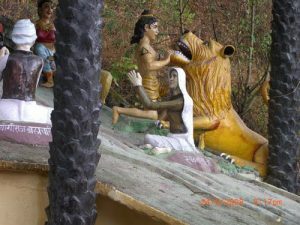 The ancient temple of Ghandiyal Devta in the vicinity is well worth a visit. Accommodation is available at the Tourist Rest House and Forest Rest House. 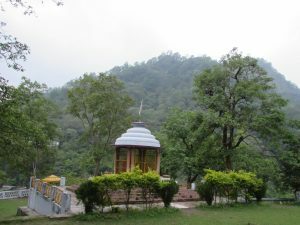 Doodhatoli situated at an altitude of 3100 mts., is covered with dense mixed forest. 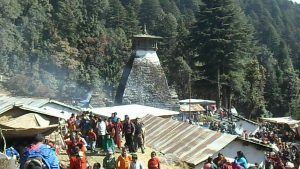 Thalisain is the last bus terminus (100 kms from Pauri), from where Doodhatoli is at a distance of 24 kms by trek. One of the most picturesque places, it commands a panoramic view of the Himalayan ranges and the surrounding area. The indomitable freedom fighter of Garhwal, Veer Chandra Singh Garhwali, was enamoured by the place. As was his last wish, a memorial in his name has been erected here after his death. A humble but bold memorial in his name creates a ‘never say die’ atmosphere under the tall Oak trees. 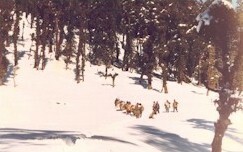 Binsar is situated at an altitude of 2480 m and is at a distance of 114 kms from Pauri. Set amidst dense forest of Oak, Deodar and Rhododendron, it is a celebrated place of worship and natural beauty. The temple dedicated to Lord Shiva is of archaeological significance. Thalisain, 100 kms from Pauri, is the last bus stop. From here a 22 kms bridle path leads to Binsar. Situated at a height of 2,200 m, Tara Kund is a picturesque spot amidst lofty mountains in the Chariserh development area. 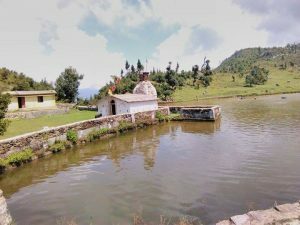 A small lake and an ancient temple adorn the place. The Teej Festival is celebrated with great gaiety when the local people come here to worship and pay homage to God. Situated on the bank of river Malini at a distance of 14 kms from Kotdwar, Kanva Rishi Ashram is an important place from the historical and archaelogical point of view. It is believed that Sage Vishwamitra meditated here. Indra, the king of Gods, was scared by his intense meditation, and sent a beautiful heavenly damsel named Menka to disturb him. Menka finally succeeded in diverting Vishwamitra’s attention. After giving birth to a girl she went back to heaven. This girl later became Shakuntala who got married to the prince of Hastinapur and gave birth to Bharat, the prince after whom our country is called Bharat. Accommodation is available at Tourist Complex, Kanvashram. 22 kms away from Kotdwar and at a height of 1,400 m, Bharat Nagar abounds in immense natural beauty. It is mentioned in the ancient Hindu texts that once this place was full of life giving herbs. From here one can have a beautiful view of the Balawali bridge of Ganga, Kalagarh dam and Kotdwar town. 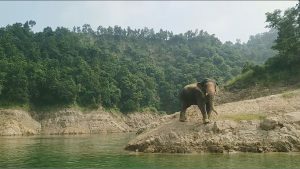 Situated at a distance of 48 kms from Kotdwar, Kalagarh is an ideal place for nature lovers. The dam across Ram Ganga River is also worth visiting. Accomodation is available at the Irrigation & Forest Rest houses.